When you slip and fall and injure yourself, you may try to sue the owner of the premises where you fell to try to recover for your injury. Generally, Florida law provides that a business owner has a duty to warn patrons of concealed damages and a duty to use ordinary care to maintain the store premises in a reasonably safe condition. 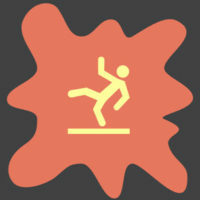 To prevail on a slip and fall claim, a plaintiff must show the business owner had actual or constructive knowledge of the spill and should have taken steps to remedy it. With this general law in mind, it is important to bear in mind that deciding whether to find an owner liable for the slip and fall is a fact-specific inquiry that hinges on a wide range of factors. The factors listed below can affect your likelihood of recovery for the accident. Something as seemingly trivial as your shoes and clothes can affect the amount of compensation you could potentially receive. The shoes or clothes you were wearing could potentially affect a court’s determination of whether you were comparatively negligent in your fall. By way of example, in Bongiorno v. Americorp., Ms. Bongiorno filed a lawsuit against Americorp, the property owner, following a slip and fall accident on the property floor. As part of their defense, Americorp argued Ms. Bongiorno was comparatively negligent because her high heels contributed to her fall while a coworker with less tall shoes was able to avoid falling. The Florida Court of Appeals rejected Americorp’s argument and found Ms. Bongiorno was entitled to recover 100 percent of the damages. However, this case is still illustrative of a potential argument a defendant may try to make. Accordingly, you should keep your shoes and clothes and take photos of them for presentation as part of your case. This will help build your claim for damages. Another factor that may affect your ability to recover is whether a store attempted to post warnings of the condition leading to a potential accident. However, only posting one sign may not be sufficient. For example, a court may find the store owner did not satisfy its duty to warn if there is no sign, the sign was too far away from the dangerous condition, or if there was only one sign for a large danger such as a hole or crack and that sign was not visible from where the accident occurred. For similar reasons as cited above, it is important to take photos or at least take note of what warnings the business posted at the time of your accident. Just because you slipped and fell does not automatically mean the store did not take reasonable precautions. If a court finds you were negligent because you were not paying attention (for example, if you were looking at your phone), that will most likely reduce your claim for damages. If you were injured in a slip and fall accident, the specific facts of your case are very important to building your claim. The experienced Florida lawyers at Lesser, Lesser, Landy & Smith, PLLC can help you understand what facts are strongest for building your claim against the owner of the premises. Contact us for a free consultation today.